African Music Explorer #001 - Bags Packed? Off To Africa! Are you in the mood for an African adventure? Then get ready! Because of visa issues, I had to leave Ghana and spent the summer with family and friends at home in comfortable Switzerland. That allowed me to finally put some money in my pocket, some meat on my bones and the first pages of my new website African-Music-Safari.com in the internet. Now I can't wait to head back to Africa with you: We're leaving on the 1st of October! That's why this is the perfect occasion for this 1st issue of my newsletter, the African Music Explorer. Thank you for subscribing, I'm glad to have you on board! 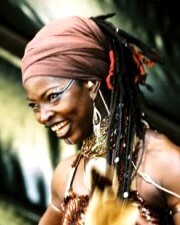 and hopefully discover more rising stars like Dobet Gnahore, the captivating female artist from the Ivory Coast. As you see, we have a lot to look forward to. The next issue of The Explorer will reach you directly from Ghana, West Africa!